Fashion #OOTD | Faux Fur In January. – Saida Chahid. Fashion, Beauty & Lifestyle Blogger. Fashion #OOTD | Faux Fur In January. January 18, 2016 November 21, 2016 by SaidaChahid. 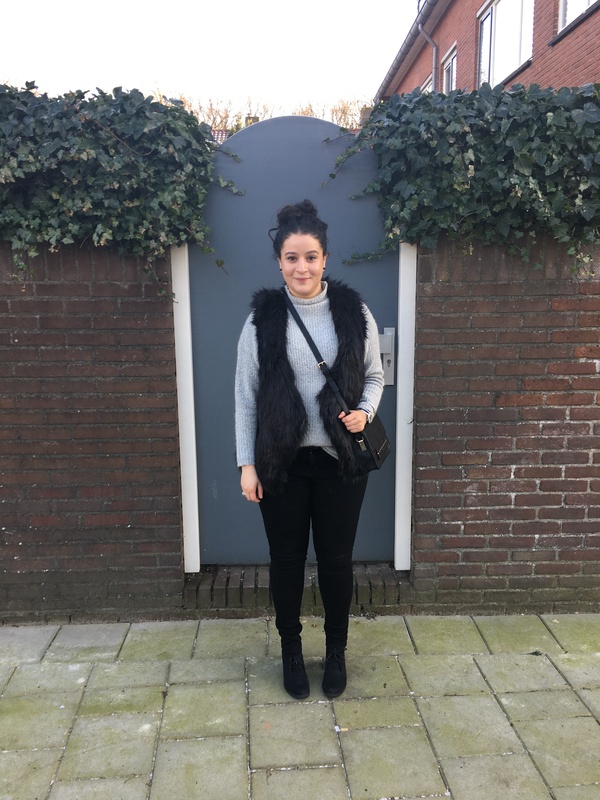 My first OOTD of 2016! It took me a while because I’m having troubles with my camera. I’m not happy how it turns out whenever I put them in my laptop. Too dark! Too blurry! I really want a new one! Black skinny jeans; I never can get enough of them. This versatile garment you will always find it in my closet and I believe I’m not the only one. What I like about this skinny jean is the fabric. It contains cotton but also elastane so I can move freely during my day. With the cold in the Netherlands I’m glad I found my holy grail in turtle necks sweaters and that for someone who used to hate them! I’m kind of enjoying the grey colour. This shade of grey in particularly. This time I chose for a half up turtle neck to wear because one; for a change and two I like wearing sweaters in this season! To stay warm I wore my faux fur gilet too. I love how edgy it looks. To keep my outfit monochrome I wore my black ankle boots with it and a black crossover bag. As you all know me Loves I like good accessories. My Daniel Wellington watch is a classic because of the black wrist belt it matches perfectly with my silver bracelets. Even though the details on my crossover bag are golden I kept my jewellery black and silver because why not? Nobody is perfect and certainly not me when it comes to outfits. Lifestyle | Hi, Meet My Blog!